A pet or dog blow dryer is a complete different dryer than for your and mine hair. Dog hair dryers do not work by heating the air with a coil. The motor of the dryer gives of the heat the warm up the air and that is warm enough for our pets. The air stream however is relatively high and it will push the water out of the fur of our dog. 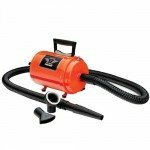 The first dog hair dryers we will look at is the very popular Metro Air Force. This dryer has nothing to do with the air-force, but it works with a little heat and a lot of forced air that will blow the water our of your dogs fur. The nice thing about the low temperature is that it will not harm you dog. Specially dog ears are real sensitive for high temperatures and that is why a human dryer is not good to use as a pet grooming blow dryer. Click here for the full Metro Air Force Dryer review. This Air force commander gets a little higher ratings than the lighter metro air force steel we looked at above. Maybe because of the higher HP and the fact that you do not have to pick up the dryer itself but the hose. Meaning that for dogs that are a little scared of noise this one might be better. 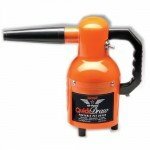 We will look in our in depth review of this popular Air force commander 2 speed 4.0 HP dog hair dryer if this is true. Click here for the full Metro Air Force Commander Review. 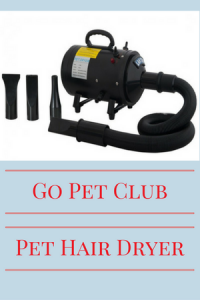 A little lower rating, but also lower priced is the Go Pet Club cat and dog hair dryer. It received over 520 reviews and the overall score was pretty good. In our review we will find out if this a good dog and cat dryer. 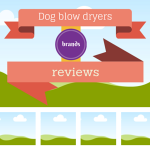 Click here for the full Go Pet Club hair dryer Review.